Introduction-Setup Package Creator is a prominent and versatile tool for generating the self-executable file setup for your windows application programs within few mouse clicks. The customized setup maker utility has the exclusive feature of generating the Install and Uninstall setups for your software and has fully professional functionality. The easy setup installer includes the detail of your program like Registry detail, Destination path detail, files information, etc. and provides the option to include shortcut dialog box creation. The simple install package maker even creates an Uninstall entry in the add/remove control panel application utility. Windows compatible installation program has an attractive graphical interface and do no modifications in the source program files while generating your software setup. The compact installation wizard creates the small-size setup enabling program developers to have an easy save and software deployment. The cost-effective setup builder package is reliable, inexpensive and easily affordable thus an ultimate solution to complex, expensive setup makers available in the market. • Professional, reliable, fast and easy to use setup making software. • Creates Install as well as Uninstall setups for your computer software. • Includes the entire detail of your program like Registry detail, Destination path and other related file information. 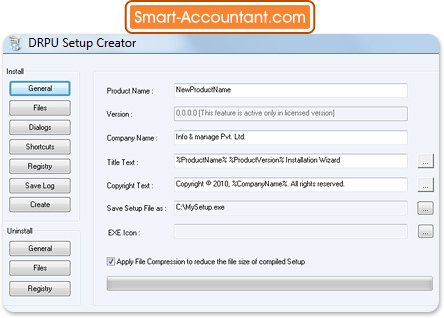 • Provides the option of include various dialog box while creating the software setup. • Generates an Uninstall entry on the add/remove program utility. • Highly interactive utility and maintains your program originality. • Have low-price and easily affordable as compare to complex setup builders.